[S6] Cokayne, and others, The Complete Peerage, volume II, page 136. [S6] Cokayne, and others, The Complete Peerage, volume II, page 234. [S22] Sir Bernard Burke, C.B. LL.D., A Genealogical History of the Dormant, Abeyant, Forfeited, and Extinct Peerages of the British Empire, new edition (1883; reprint, Baltimore, Maryland: Genealogical Publishing Company, 1978), page 45. Hereinafter cited as Burkes Extinct Peerage. Thomas Berkeley, 5th Baron Berkeley also went by the nick-name of Thomas 'the Sheep Master'.1 He was appointed Knight on 9 September 1513 from the Earl of Surrey.2 He fought in the Battle of Flodden on 9 September 1513.2 He held the office of Constable of Berkeley Castle on 15 May 1514.2 He held the office of Sheriff of Gloucestershire between November 1522 and November 1523.2 He succeeded as the 5th Baron Berkeley [E., 1421] on 12 September 1523.1 His last will was dated from 28 April 1532 to 11 January 1532/33. [S6] G.E. Cokayne; with Vicary Gibbs, H.A. Doubleday, Geoffrey H. White, Duncan Warrand and Lord Howard de Walden, editors, The Complete Peerage of England, Scotland, Ireland, Great Britain and the United Kingdom, Extant, Extinct or Dormant, new ed., 13 volumes in 14 (1910-1959; reprint in 6 volumes, Gloucester, U.K.: Alan Sutton Publishing, 2000), volume II, page 136. Hereinafter cited as The Complete Peerage. [S6] Cokayne, and others, The Complete Peerage, volume II, page 137. Henry Berkeley, 7th Baron Berkeley also went by the nick-name of Henry 'the Harmlesse'.2 He succeeded as the 7th Baron Berkeley [E., 1421] on 26 November 1534.2 He was appointed Knight, Order of the Bath (K.B.) 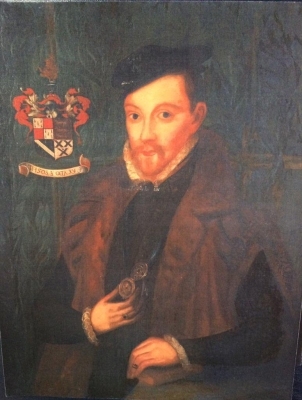 on 28 September 1553.2 On 13 May 1555 he had special livery of his lands, by Royal Warrant, including Berkeley Castle.2 He held the office of Lord-Lieutenant of Gloucestershire between 1603 and 1613.2 His last will was dated 20 December 1612. [S6] Cokayne, and others, The Complete Peerage, volume II, page 138. From before 1590, her married name became Townshend.1 From 9 March 1597/98, her married name became Berkeley.1 Her last will was dated 20 July 1617. [S6] Cokayne, and others, The Complete Peerage, volume II, page 139. He was educated at Christ Church, Oxford University, Oxford, Oxfordshire, EnglandG.1 He succeeded as the 9th Baron Berkeley [E., 1421] on 10 August 1658.1 He held the office of Custos Rotulorum of Gloucestershire between 1660 and 1689.1 He was a member of the Committee of the East India Company between 1660 and 1697.1 He was appointed Fellow, Royal Society (F.R.S.) on 20 May 1663 one of the original members.1 He was Governor of the Levant Company between 1673 and 1696.2 He was appointed Privy Counsellor (P.C.) on 17 July 1678.2 He was created 1st Earl of Berkeley, co. Gloucester [England] on 11 September 1679.2 He was created 1st Viscount Dursley, co. Gloucester [England] on 11 September 1679.2 He held the office of Master of Trinity House in 1681/82.4 He held the office of Custos Rotulorum of Surrey between 1689 and 1698.2 He donated the valuable library of Sir Robert Coke (husband of his aunt Theophila) to Sion College, London.2 He was a member of the Committee of the East India Company from 1698 to 1699.1 His last will was dated 21 September 1698. [S6] G.E. Cokayne; with Vicary Gibbs, H.A. Doubleday, Geoffrey H. White, Duncan Warrand and Lord Howard de Walden, editors, The Complete Peerage of England, Scotland, Ireland, Great Britain and the United Kingdom, Extant, Extinct or Dormant, new ed., 13 volumes in 14 (1910-1959; reprint in 6 volumes, Gloucester, U.K.: Alan Sutton Publishing, 2000), volume II, page 139. Hereinafter cited as The Complete Peerage. [S6] Cokayne, and others, The Complete Peerage, volume II, page 140. [S2] Peter W. Hammond, editor, The Complete Peerage or a History of the House of Lords and All its Members From the Earliest Times, Volume XIV: Addenda & Corrigenda (Stroud, Gloucestershire, U.K.: Sutton Publishing, 1998), page 88. Hereinafter cited as The Complete Peerage, Volume XIV. [S18] Matthew H.C.G., editor, Dictionary of National Biography on CD-ROM (Oxford, U.K.: Oxford University Press, 1995), reference: "Berkeley, George". Hereinafter cited as Dictionary of National Biography. [S6] Cokayne, and others, The Complete Peerage, volume II, page 431.